Filled with compassion, courage and heartfelt moments, Mao’s Last Dancer is awe-inspiring to say the least. You’ll be spellbound by the incredible story of a small boy who rose to greatness and discovered that freedom is obtainable if you hold fast to your principles. If you’re a fan of ballet, you’ll appreciate the entertaining performances as they’re artistically beautiful. It’s a profound biographical tale of a gifted chinese ballet dancer’s journey of freedom and the amazing circumstances surrounding his defection to the USA. 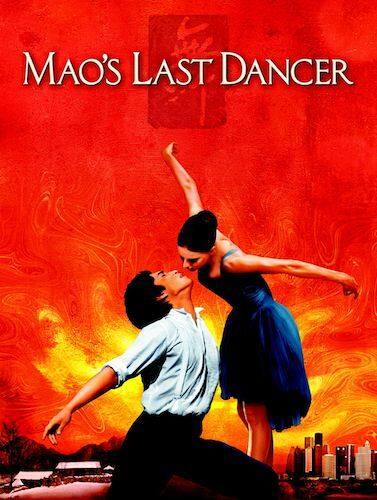 Mao’s Last Dancer is based on the best selling autobiographical book of the same name by Li Cunxin. The book chronicles a young boy living in a poverty stricken area of China in the 70s who was chosen by the government at the tender age of eleven to live in Beijing, separated from his family to study ballet. The paradox of Li Cunxin’s story is that political overtones become the reason Li attained his level of excellence in his native country and also attributed to his success as a talented ballet performer on the international stage. Not only are his accomplishments the result of Mao’s Communist regime, they in turn, happened in spite of it. At the heart of the film is a young boy’s determination through the mentoring of a compassionate teacher to bring honor to his family and himself. The beginning scenes take place at the airpot in Houston in the year 1981. Li, played by Chi Cao (a newcomer to film and a Principal Dancer with the Birmingham Royal Ballet), is 19 years of age and immediately introduced to the culture of the United States. He is puzzled by the welcome hug of his new house guest Ben Stevenson, played by Bruce Greenwood, (Star Trek 2009) gives him upon arrival. Immediately, the film flashbacks to 1972 telling the story of how a boy from a rural peasant home in China was molded into a world class dancer that has been invited to perform before the Houston Ballet. We soon find out the film will unfold in a series of flashbacks to the life and training in China of a small boy to his newfound life as an elite ballet dancer in the United States. The contrasts in cultures are startling. One can only cringe as we view a small boy living in a barracks situation with other boys his age and the grueling routine of his day of dance training. Where tears are met with disapproval and hugs are no where to be found. Li learns early on if he is to succeed he will have to compensate for his small statue. By candlelight, he begins his own nightly ritual of attaching bags of sand to his legs as he climbs the steps of the compound to build his strength. The loneliness and the sterile conditions of the living quarters are heartbreaking. Li has a photo of his family that gives him the determination and courage to beat the system. The culture shock of America in the 70s is almost overwhelming for Li. Rick James’s song, ‘Super Freak’ is blaring at the disco; the opulence of food, roomy housing quarters, creative clothing options and most importantly, the freedom of thinking independently are understandably alluring. When Li is given the chance to stay in America, it’s really a no brainer. However, the consequences are harsh as he is told that he can never go back to China and that his family can never visit him in the states. The ending is incredible and based on true facts. This is not a Hollywood script, this is one person’s story and believe me, you can’t help but be inspired by his circumstances and choices. The ballet sequences are beautifully choreographed and a treat to be savored. You’ll view Li’s progression as an international artist as he becomes one of the best ballet dancers in the world. While silently cheering him on, you will be amazed at the two crescendo endings that will bring tears to your eyes. The film reminded me of another story founded upon a prodigy (Shine 1996) based on the world renowned pianist David Helfgott in which Geoffrey Rush earned his Academy Award for Best Actor. Although Helfgott’s story is one of struggling with mental illness; Li struggles with the tugging of his homeland China. While reading the production notes, a discovery was made; Jan Sardi the screenplay writer who was nominated for an Academy Award for Shine was also the screenplay writer for Mao’s last Dancer. Bottom-line: A feel good true story based on courage that has a great ending! Being a lover of biographies, this one is at the top of my list; I LOVED this film.